Farmtech Exhibition 2018, Moscow - BMT Medical Technology s.r.o. In the second half of November, the most significant exhibition of devices and equipment for the pharmaceutical industry in the Russian market of Farmtech 2018 was held again in Moscow. After good experience from last year when we participated in the exhibition just as a co-exhibitor of one of our Russian dealers, we decided for our own stand this year. The financial situation on the Russian market continues to be tense and we have been actively seeking for opening another major segment on the Russian market for several years - to supply the steam sterilizers and heating technologies for pharmaceutical companies. Russia has an extensive network of medicament manufacturers with an intended goal to export them. However, the most pharmaceutical productions are still equipped with the obsolete technology mainly, because of purchasing of low-quality and cheap medical devices from China, South Korea ... Many of them have already gained negative experience and are therefore becoming more interested in quality foreign instruments and devices regardless their much higher prices. Due to this, a real chance not for only BMT products will be involved but also the whole MMM Group is involved in the process of modernizing entire pharmaceuticals industry in Russia. On the Russian market, we have succeeded to obtain a great number of interesting orders in BSL laboratories and in the pharmaceutical industry, for example in Ufa city, where firstly presented on the Russian market Venticell® IL 700-2, class 5 operates alongside in addition to a wide range of sterilizers Sterivap® HP IL. Thanks to our systematic efforts for establishmenting of new contacts in the field of pharmaceutical companies and the care of our customers, after approximately one-year preparation of the project, when we gradually eliminated all our competitors in the negotiations with the customer, we have obtained the largest contract for delivery more than 10 Sterivap® HP IL sterilizers. The devices are currently being manufactured and their FAT will take place at the beginning of the 2019th. The participation in this year's exhibition, according to Mr. Ilja Karasev, Director of our BMT-MMM Moscow Company, Gennadii Sergeyev, Director of our BMT UA company in Kiev and Ing. 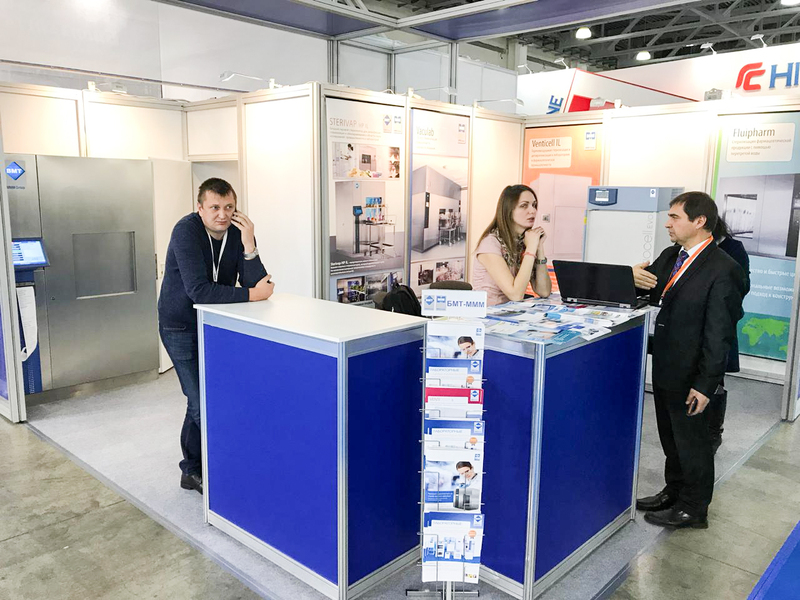 Miroslav Musil, who personally participated in the exhibition, was successful for us, as we managed to gain new advantageous contacts with other possible future customers in Russia and other neighbouring countries in addition to deepening our contacts with our existing partners. Exactly the pharmaceutical orders, which will be more and more frequently supplied even to the private companies, will already have had a decisive impact on our sales success in the Russian market this year.